Those who are diagnosed with autism require those who love them to love, understand, and accept them for who they are. 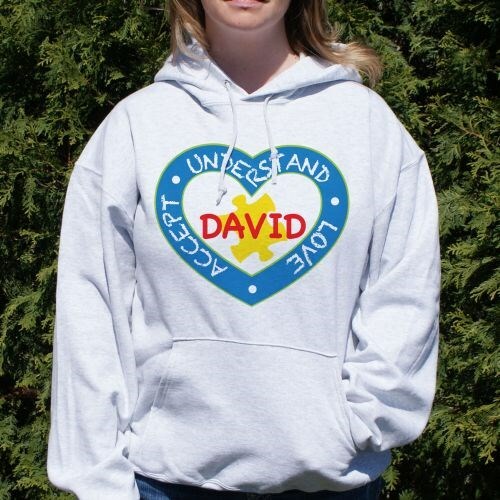 Help spread these principles when you wear this special personalized autism awareness hoodie. Our sweatshirts work as great Autism awareness gifts to help educate others about the autism spectrum. This autism awareness design is featured on our premium, 50/50 cotton/poly blend, machine washable hooded sweatshirt. Available in youth sizes S-L and adult sizes S-2XL. Free personalization of any name is included. Additional Info Shop for more autism awareness gifts, apparel, and gear at MyWalkGear.com! If we work together, we can raise awareness of this important cause and educate others about the intricacies of the autism spectrum. We'll also give a portion of your purchase to the charity or cause of your choice.